UM system status updates are available at https://status.missouri.edu/. Users can subscribe to receive updates via text messages, emails or RSS. Notices are sent for new outages, updates, and resolutions for a number of IT Systems at MU. UMKC system status updates are available at https://www.umkc.edu/is/Support/outages/. Notices are sent to groups as selected by the author of the outage notice. The UMKC Instructional Technology Services (ITS) team has moved to UMKC Online. If you need support with Canvas, Blackboard, Panopto, Exam Proctoring, or other instructional tools you can find more info here: https://online.umkc.edu/support/, by calling 816-235-6700, or emailing them at its@umkc.edu. UMKC has wireless access covering most buildings and the Residence Halls. If you need help connecting your phone, laptop, or gaming device you can find instructions here: https://www.umkc.edu/is/wireless. Filed under Faculty/Staff, Parents, Students, Visitors. 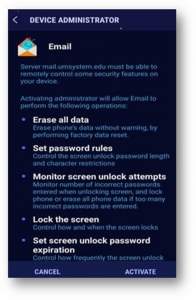 All UMKC Students, Faculty, and Staff can manage their passwords using the Secure Authentication Toolkit. This includes changing your password or resetting it, if you’ve forgotten it. New students will need register your data, which will enable Two Factor Authentication on your account. This is required to access key UMKC resources and to update your password. More information and instructions can be found here: https://www.umkc.edu/is/password/. On March 21st, a PIN code will be required on all mobile devices that have a UM email account configured on them, which includes UMKC employees with @umkc.edu email addresses. This includes tablets, smartphones or any device that uses the ActiveSync protocol to connect. Many individuals across the university already use a PIN code to lock their devices, and the requirement will have no impact on them. Device password and PIN enforcement is a security feature to protect you and your mobile devices against loss of highly personal data on the device, including private and work-related messages, contact information and even mobile banking data. After March 21st, you may notice a screen similar to the one below on your Android or iPhone mobile device. On Android devices, press the “Activate” button on the screen to accept the security feature. On iPhones, follow the instructions on-screen to open iOS settings and turn the Passcode feature on (see figures below). Press the Activate button to accept the security policy and set up a PIN. 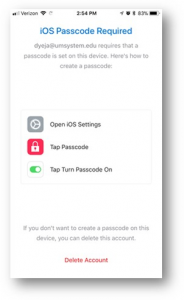 Follow instructions on screen to Open iOS settings, tap Passcode, and Turn the Passcode On. This policy is ONLY enforcing a four-digit PIN. Fingerprint and face-ID would still be allowed, but pattern-unlock would no longer be allowed on Android devices. Any other actions taken on your device will not occur without a request from you and\or the approval from the Security and Account Management teams. If you choose not to accept the policy, you would no longer have the ability to access your University email on your mobile devices. If you have any questions or need assistance addressing this change, please contact the UMKC IS Call Center at callcenter@umkc.edu or 816-235-2000. The UMKC Call Center closed for the holidays. The UMKC Call Center will be closed for the holidays from Saturday, December 23rd through Monday, January 1, 2018. We will re-open with normal business hours on January 2, 2018. Need to do homework but don’t feel like going to a student computing lab? Visit our Remote Labs website! Numerous University software applications are available for faculty, staff and students to use on the Remote Labs website. It an excellent resource when you want to work from home or if the labs are busy. It’s easy to connect. Simply go Remote Labs and click on the yellow Connect Now button. Use your UMKC login and password to access the website. There are connection instructions and a FAQ on the website if you have questions. UMKC is updating the way computers and devices connect to the UMKC network on December 20th. Specifically we are updating to the latest version of TLS (Transport Layer Security), which is used to secure network communications. While campus computers have been updated, home users running Windows 7 may need to update to the latest version of TLS so that they can use Remote Desktop to connect to UMKC’s network. Listed below are instructions on how to do so. Home users running Windows 10 are not affected at this point. Windows 8/8.1 also includes the TLS update. Consult the Secure Authentication Toolkit FAQs page for more information. If you experience difficulties during the process, please contact your local IT Tech Support team. Please note: The two-factor authentication process is an additional implementation of the Secure Authentication Toolkit first implemented in Fall 2016. If you have yet to register your University account, visit the Secure Authentication Toolkit webpage to register or to learn more. Beginning this Saturday, March 4th 2017, UMKC students will be required to set their passwords using the new Secure Authentication Toolkit. If a student has not registered their security data in the Secure Authentication Toolkit before this weekend and needs to set a password, the toolkit will recognize the student has not registered and will automatically prompt the student to register their information so they can then set their password. In conjunction, all Pathway password reset links will be transitioned from the old PeopleSoft password reset tools to the new Secure Authentication Toolkit password reset tools. This is another step in the process UM campuses are adopting in order to establish a more secure verification process to better protect personal data and University systems. Earlier this week, the UMKC IS password page went live, which features the new Secure Authentication Toolkit password reset tools as well as detailed information regarding which tool to use depending upon each user’s particular situation. The UMKC Call Center has been directing current students to register their information in Secure Authentication Toolkit since November and new students will now be able to register and set a password in one process. If you have questions or need assistance, please contact the UMKC Call Center at 816-235-2000, callcenter@umkc.edu, over via the online problem report form.